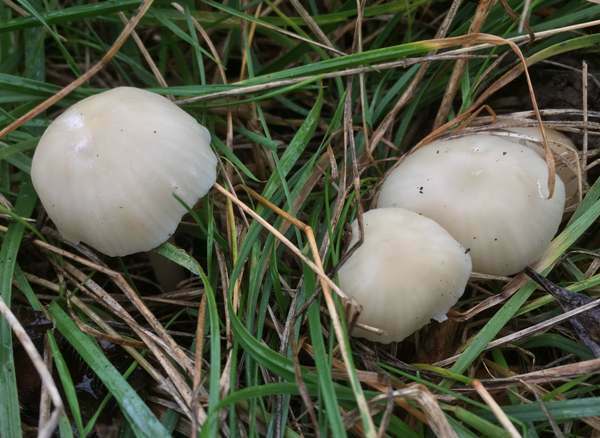 Its distinctive odour is the most obvious differeence between this whitish waxcap and the otherwise macroscopically very similar Snowy Waxcap Cuphophyllus virgineus. Fairly common throughout most of Britain and Ireland, Hygrocybe russocoriacea is also recorder in many parts of mainland Europe from Scandinavia down to the Mediterranean. This species is also listed on some North American websites as occurring in parts of the USA. Described scientifically in 1848 by British mycologists Miles Joseph Berkeley and T. K. Miller, who named it Hygrophorus russo-coriaceus, the Cedarwood Waxcap was transferred to the genus Hygrocybe in 1969 by two other British mycologists, Peter Orton and Roy Watling (b. 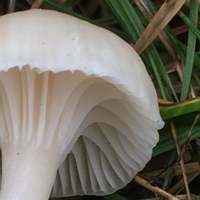 1938), whereupon it acquired its currently accepted scientific name Hygrocybe russocoriacea. Synonyms of Hygrocybe russocoriacea include Hygrophorus russocoriacea Berk. & T.K. Mill., Camarophyllus russocoriaceus (Berk. & T.K. Mill.) J.E. Lange, and Cuphophyllus russocoriaceus (Berk. & T.K. Mill.) Bon. The genus Hygrocybe is so named because fungi in this group are always very moist. Hygrocybe means 'watery head'. russocoriacea comes comes russo- meaning Russian and -coriaceus, the Latin word for leather; it stems from the smell of Russian leather associated with this waxcap. Slightly sticky; 0.5 to 3cm across; initially convex, becoming flat-topped and sometimes developing a slight depression; cream or ivory to pale yellowish, slightly darker in the cent; margin slightly translucently striate. Moderately didtant; deeply decurrent; initially almost white, becoming slightly yellowish with age. 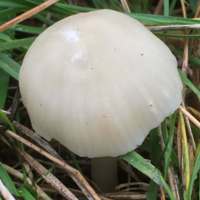 1.5 to 4cm long and 3 to 65mm diameter; cylindrical, tapering at the base; dry and silky; concolorous with cap, often with a pinkish tinge towards the base; hollow; no stem ring. Ellipsoidal to ovoid; 7.5-9 x 5.5-6.5µm; inamyloid. 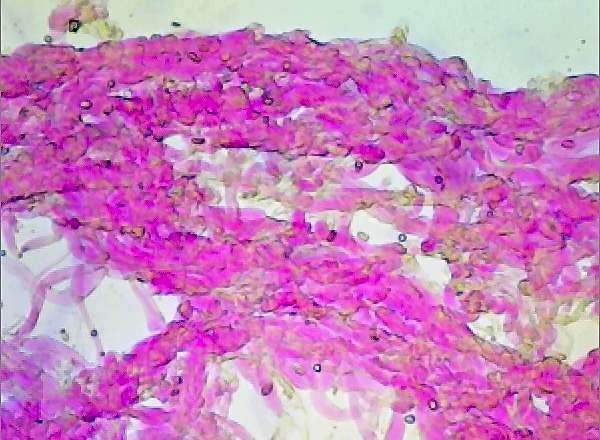 Clavate, 40-55 x 6-7.5µm, mainly four-spored. 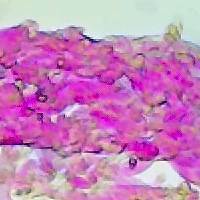 Interwoven - see photomicrograph, left. Odour of 'Russian leather' or sandalwood; taste not distinctive. Closely cropped or mown grassland, including coastal dune systems, where artificial fertilisers and herbicides are not spread. Autumn and early winter in Britain and Ireland. Cuphophyllus virgineus is similar but does not have the cedarwood or Russian leather odour.